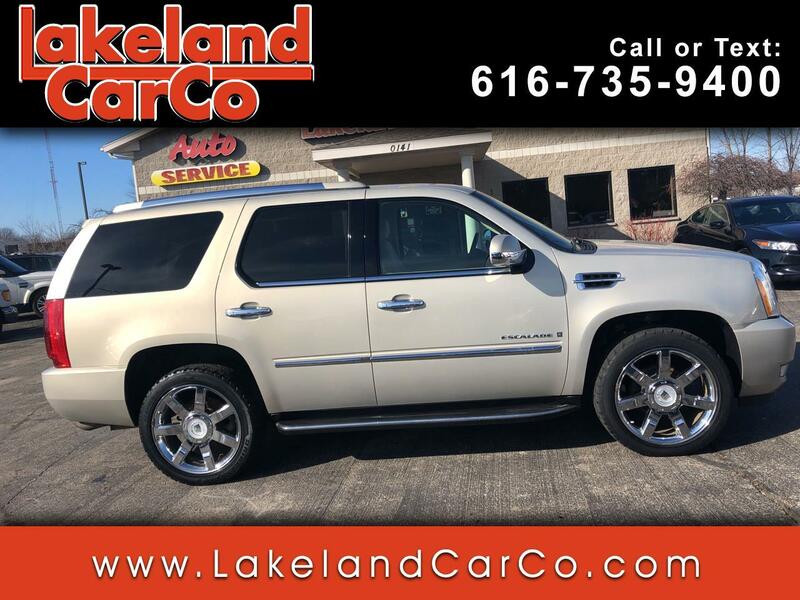 Used 2008 Cadillac Escalade AWD for Sale in Grand Rapids MI 49534 Lakeland Car Co. The '08 Escalade AWD understands its identity and makes no apologies for being big, bold, and bad! Escalade rolls down streets with conviction, sporting a powerful 6.2L V8 engine throwing out 403hp, coupled to a 6-Speed automatic transmission. In addition, Cadillac's chrome detailed exterior, luxurious interior, and strengthened frame have helped make it the most famous SUV in hiphop. This 2008 Escalade gets up to 18mpg on the highway. Our luxury SUV has 4 doors and 3 rows of seats that can hold up to 7 people. Sink into the heated power seating. Adjust the power pedals to meet your needs. Set the navigation system, open up the sunroof, adjust your tunes for the premium Bose sound system via the steering wheel and feel secure knowing that ABS, airbags, and daytime running lights are in place.